I'm exhausted. Bill and I left the house at 7:30 this morning and rode our bikes to Fort Myers Beach and back. The "to" was a lot easier than the "back." The beach was beautiful and we walked up to Bowditch Point picking up shells before we headed home. Let me tell you about our bikes. One day while driving through Parker Lakes, we saw a sign - "FREE." The two bikes that it was sitting on were ours! We rode them home. Bill's is great with just some rust on the back - but mine had some problems with gears, so I purchased another bike at a garage sale with a basket, speedometer and bell for $20 and we are set to go! After our day on the road, we relaxed in the hot tub before enjoying one of Bill's fabulous dinners. 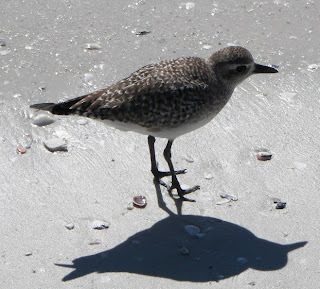 On the beach, these cute Sanderlings run back and forth with the waves. 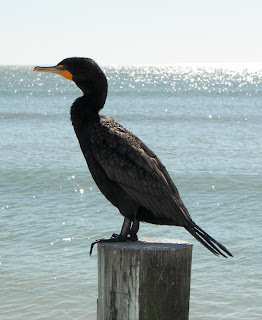 This is a Double-crested Cormorant. 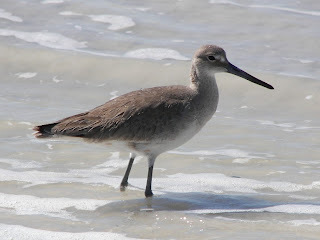 Apparently, the double crests only show during the breeding season and even then, they are hard to see. 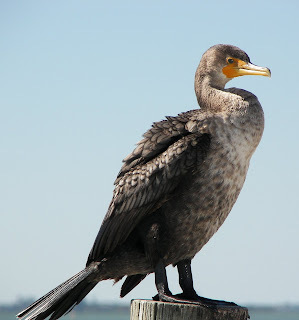 This is also a Double-crested Cormorant, but it is a juvenile with slightly different coloring. The Super Bowl just started. As a former Pennsylvania resident, I should be routing for the Steelers - but I can't help hoping the Cardinals win. On Wednesday my oldest grandson Zachary arrives. I can't wait! We are taking him and his parents to Orlando to see the Mouse.